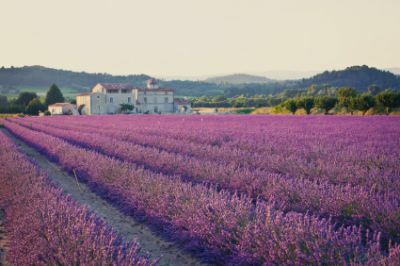 Property Owners: List your Provence property on the premier site specialising in French holiday lets. More Info. Whether you choose a villa or gite in Provence, you’re assured of a warm welcome and a fantastic holiday. A villa in Provence, like all holiday villas in France, possesses a warm charm that cannot be found anywhere else in the world, and an aura that whispers in your ear about fine wines, simple, tasty food and a promise of hidden delights. For lovers of art, festivals and culture, the university town of Aix-en-Provence is a dream come true. Packed with beautiful architecture, a walk around the city will quickly help you to understand how it’s influenced artists and writers throughout the years. Cézanne’s studio, preserved as it was, is a must-see, while a visit to the Bibémus Quarries, a little way outside the city, will take you to the very heart of the artist’s inspiration. Still in Aix-en-Provence, take some time to indulge yourself at the Thermes Sextius spa. The mineral waters are piped at a luxurious 36 degrees and used for a variety of spa treatments. You won’t regret it. A visit to the ancient city of Arles will put you firmly in touch with well-preserved Roman and Latin architecture and monuments, many of which are classified by UNESCO as world heritage sites. Arles was also home to Vincent Van Gogh for a period in his life, and there is plenty of evidence pointing to his sojourn. If you visit in September, you’ll be in time for the Rice Harvest Festival, a three-day Spanish fiesta. Complete with bull-running, paella and the crowning of the Rice Queen, who then sails down the River Rhône on a barge while being showered with rice, it’s an unforgettable experience. The hilltop village of Gordes, with its white-stone houses and buildings that seemingly grow out of the face of the mountain, is acknowledged throughout the country as one of its most beautiful villages. Although it’s become a summer retreat for artists, politicians and business people, it’s well worth a visit, as there are always plenty of cultural events happening during the summer months and access to views that have to be seen to be believed. Another place renowned for its beauty is the village of Rousillon, distinguished by its red cliffs and ochre quarries. A stroll along the footpath of the Sentier des Ocres will give you a true sense of their majesty, particularly when the colours contrast with the brilliant blue of the Provençal sky. Call in to the Conservatoire des Ocres et des Pigments Appliqués and discover the world of ochre and the interesting way it’s treated and ultilised in construction. And before you leave Rousillon, be sure to visit the nineteenth century clock and bell tower, complete with wrought-iron belfry. As a tourist, you’re never far away from good food, be it at a local café or restaurant, or when cooked from fine local produce in your own gite or villa. Many world-famous dishes originate in the region and just demand to be tasted at source. The list is long, but Ratatouille and Bouillabaisse come readily to mind. Once sampled in their homeland, you’ll be spoilt for life, but don’t stop there as there are many more local treats secreted away on the menu. Finally, don’t miss the opportunity to try Pastis, the traditional local liqueur, but remember to drink it with plenty of water!